Inspedium becomes the first web hosting company in Pakistan to offer free SSL certificates to clients. This helps improve security for Pakistani businesses. 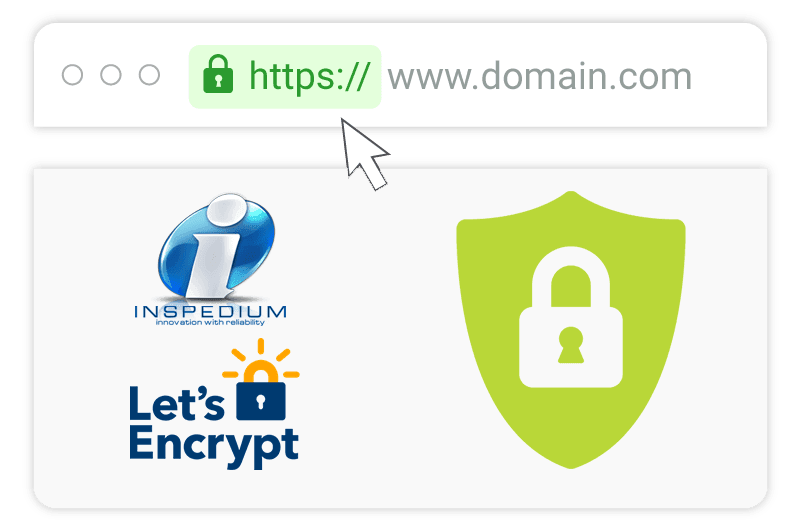 Karachi, Pakistan, October 08 2017 – Pakistani-owned and operated web hosting company Inspedium Corp. is proud to officially announce their partnership with the Let’s Encrypt™ initiative offered by the nonprofit Internet Security Research Group (ISRG). Let’s Encrypt’s mandate is to provide people and organizations secure digital certificates in order to enable HTTPS (SSL/TLS) for websites, free of charge and in the most user-friendly way possible. “Security matters to every business online, whether they are run by individuals or large corporations.” ~ Zahid Sindhu – CEO Inspedium Corp.
“Security matters to every business online, whether they are run by individuals or large corporations.” says Zahid Sindhu, Inspedium’s CEO. Inspedium has started rolling out this service to all existing linux web hosting accounts also. Zahid Sindhu estimates that all existing accounts will have SSL installed as early as November 01, 2017. Using Let’s Encrypt’s technology users can now obtain digital certificates for their websites at zero cost. “The mission of Let’s Encrypt is to get the Web to 100% encryption” says Josh Aas, Executive Director of Let’s Encrypt. Let’s Encrypt’s stats on their journey to 100% encryption speak for themselves; starting in late 2015, they have secured communication for over 54 Million websites today! Inspedium’s partnership with them means that even more websites can benefit from this technology, resulting in a safer web, particularly for Pakistan. Based in Karachi, Pakistan – Inspedium was founded with one goal in mind – to provide the best possible web hosting service to their clients; to help them succeed! For over 14 years, Inspedium has done just that and more! Their clients have come to know them as the company that will go above and beyond to help them with their hosting needs. Their entire focus is on providing their clients with real business value through their quality services. To learn more, please visit www.inspedium.com. Let’s Encrypt is a free, automated and open Certificate Authority issuing digital certificates for website encryption globally. Let’s Encrypt is a service provided by the Internet Security Research Group (ISRG), a public benefit organization with a mission to reduce financial, technological, and education barriers to secure communication over the Internet. Let’s Encrypt continues to secure communications for millions of websites. For more information or to offer your support, visit www.letsencrypt.org.